Summary : This tea is a sweet tooth's dream. Like another licorice tea I tried from the Dragonwater Tea Company (now out of business), this tea is super, super sweet...with a after-taste that simply lingers seemingly forever. Review : I really do have an incurable sweet tooth. Despite not really being able to eat most junk foods, especially chocolate, I still can't get rid of this sweet tooth that seems to have been genetically implanted. As such, during my last order with the Dragonwater Tea Company (now out of business) I ordered a tea that, after reading the ingredients, I fervently hoped would satisfy my sweet tooth...without any of the bad things that are found in so many other sweet foods and beverages of the world today. The tea I ordered is a herbal tea called Ginger Fresh, and my, what a lovely sweet tea it turned out to be. 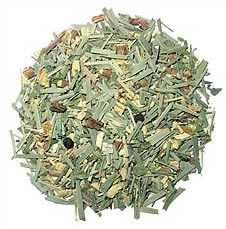 The Licroice Mint Tea from Dragonwater Tea Company (now out of business) contains the following ingredients : lemon grass, licorice, ginger, peppermint, lemon peel, and black pepper. Now, as of the time of this writing, this tea is listed on their site under the Ayurvedic Tea section. Which of course begs the question...what the heck is a Ayurvedic Tea? Simple, Ayurvedia is simply a way of describing an ancient Indian tradition of using teas for healing focused on keeping an individual in balance and aligned with nature. Hence...Ayurvedia Tea. But make no mistake, this tea is still a herbal tea. Just bringing this out to avoid any confusion. The aroma of the tea right out of the bag left zero doubt in my mind that I struck gold in the sweet tea department. Unzip the package and wham, almost immediately you are greeted by a strong yet pleasant fragrance of mint and ginger. Yet, once brewed, this tea doesn't taste like mint, despite the fragrance. This actually didn't surprise me, due to my past licorice tea tasting experiences. I've discovered that in quality loose-leaf teas that contain licorice, other flavors tends to be lost or buried in the background behind the strong flavor of licorice. And so it was with this tea. The licorice flavor simply dominates the flavor. The flavor of peppermint is nowhere to be found at all, which is really surprising considering how strong peppermint usually is. The ginger flavor of the tea is there, but it is weak, and you sort of have to work at it to find it. Lastly, you also get a weak flavor of lemon as well. But make no mistake...this is a licorice tea. And licorice being licorice, this tea is REALLY, REALLY sweet. Additionally, like other fine licorice teas, the after taste lingers and lingers. Overall, if you like sweet teas, or need a tea to "wake you up" in the morning that doesn't have the bitterness of a black tea, then the Ginger Fresh tea from the Dragonwater Tea Company (now out of business) has your name on it. Recommendation : Yes. Anyone who likes "sweet things" runs the real risk of falling in love with this tea. The licorice in this tea makes the tea super sweet and has a wonderful after-taste. Of course, if you hate sweet things, then this tea is most definitely not for you. Brewing Instructions : Use 1-1.5 teaspoons of tea leaves. Pour 1 cup (5.5 ounces, but 6 works quite nicely) boiling water over the leaves. Let the tea brew for 5-10 minutes. I brewed the tea for 8 minutes for this review.